Accessories: Accompanied by original fitted box, and Patek Philippe Extract from the Archives confirming date of production of the present watch in 1948 and its subsequent sale on April 3, 1951. Literature: Reference 530 is illustrated in Patek Philippe Wristwatches by Martin Huber & Alan Banbery, second edition, p. 265. Imagine that the design of a historical piece is so relevant that one of Switzerland’s most prestigious brands decides to relaunch it as a modern reiteration. 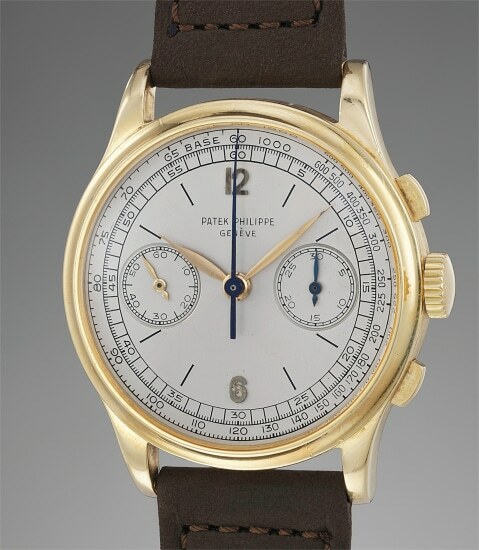 That is what the current Patek Philippe reference 5170 chronograph is, an homage to the delightfully awesome reference 530. Launched in 1937, Patek Philippe’s reference 530 remains one of the rarest and largest vintage chronograph models manufactured by the firm, its large 36.5mm diameter being as contemporary as it was 80 years ago. The reference 530 can be considered the ultimate in terms of rarity, desirability, and aesthetic beauty. The case and dial design of the present lot hit all the right notes. The perfect equilibrium between the case diameter and thickness, the powerful lugs and concave bezel speak of highly contemporary elegance. The gorgeous silver dial has turned a pleasing vanilla, the crisp hard enamel signature exudes beauty and grace. Adding to the appeal of this timepiece is the fact that it comes from the family of the original owner where is has remained for decades unworn. Fresh to the market, the present yellow gold reference 530 chronograph is only the 26th to appear on the market. The present reference 530 chronograph impresses with its original factory finished case, the satin and brushed surfaces provide for an arresting contrast and the gold hallmarks are crisp presenting an unbelievable opportunity not to be missed by the avid collector.